Sugar and spice… but what are Valentines made of? The manufacture of elaborate valentines in the Victorian era fascinated Charles Dickens and continues to intrigue us today. These were true confections, made by hand: imaginative, but repetitive. While the printing and embossing was done by men, each of the female workers (referred to as ‘nymphs’ by Dickens) added a precise piece to the ensemble: a colour from a watercolour pot, a scrap, a paper or fabric flower, a tinsel ornament, a shell, a glass bead, gauze, lace, netting…. The results, protected in boxes, were luxurious love tokens, far from the cruelty of crude contemporary ‘comic’ valentines. Dickens’ article published on Febrary 20 1864 as Cupid’s Manufactory (All the Year Round, volume XI, pp 36-40) is now online through the wonderful Dickens Journals Online project (University of Buckingham). Flamboyant in style, the article describes in meticulous detail the process of making valentines at the (unnamed) manufactory of Joseph Mansell and lists the componenents he saw being applied to the embossed lace paper which is the basis of most elaborate valentines. This page from the Illustrated London News of February 14 1874 shows the whole process, very much as described by Dickens ten years earlier, but at the premises of George Meek and the workshop of Eugene Rimmel. 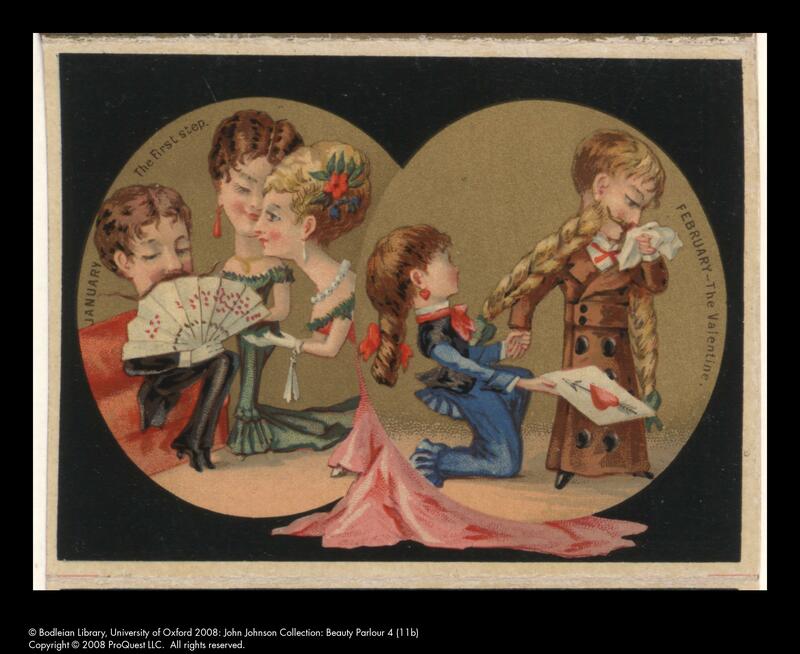 For more information about valentines in the context of the John Johnson Collection, see the two posts on this blog (February 2012, February 2013) and the online pages from The season for love (exhibition 2010). 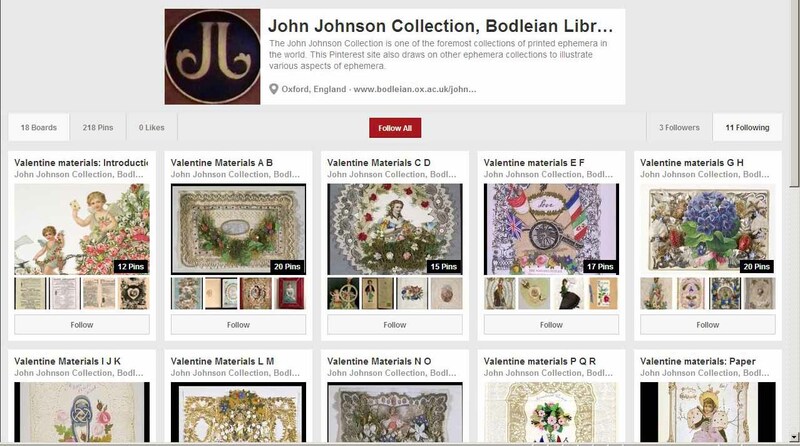 For the wider context, see the valentine entries from The John Johnson Collection’s Ephemera Resources blog. Author Posted on 30 January 2014 2 February 2016 Categories Online exhibitions, ValentinesTags Pinterest, valentines1 Comment on Sugar and spice… but what are Valentines made of? It is Valentine time again. In 2010 we mounted a small exhibition called The season for love in the Proscholium of the Bodleian Library. Last year, there was an international initiative on Twitter (#loveheritage) led by #AskArchivists to surface valentine collections, which resulted in our little online gallery of comic valentines. This year it is a great pleasure to collaborate with the National Valentine Collectors Association to highlight the valentines of Eugène Rimmel (1820–1887). Also online are the excellent special Rimmel issue of the Valentine Writer (newsletter of the National Valentine Collectors Association) by Nancy Rosin, and Malcolm Warrington’s beautiful online Rimmel exhibition. Images: all images are from the John Johnson Collection (JJ) and are copyright Bodleian Library, University of Oxford (and, where indicated) ProQuest. Click to see the large images, but do not reproduce any images without permission. While we have 20 boxes and several albums of valentines in the John Johnson Collection, there are very few Rimmel valentines. However, we hold a wealth of ephemera relating to the varied activities of the firm. 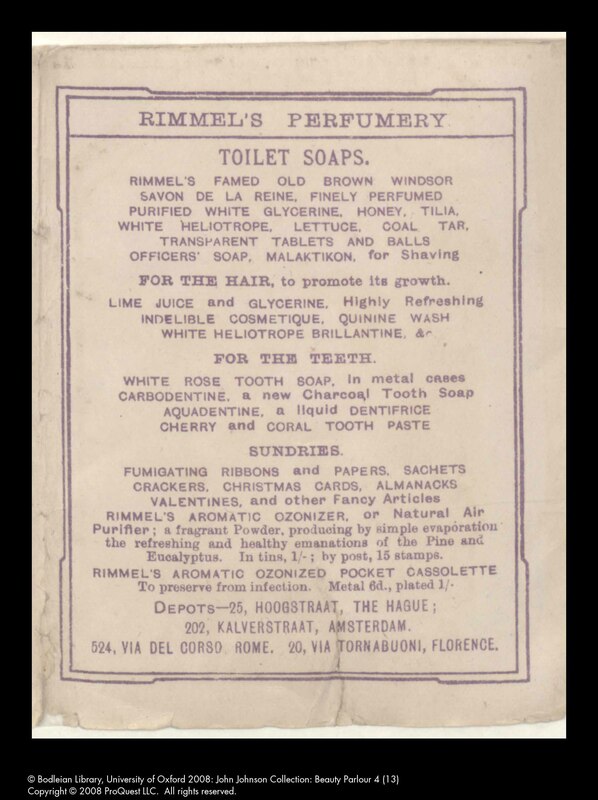 Advertisements for perfumes, table fountains, disinfectors, soaps, Christmas novelties, Easter eggs, fans, etc, are outside the scope of this blog, but much of this material has been digitised as part of ProQuest’s The John Johnson Collection: an archive of printed ephemera (freely available in the UK through FE, HE, public libraries and schools, and by institutional subscription elsewhere). 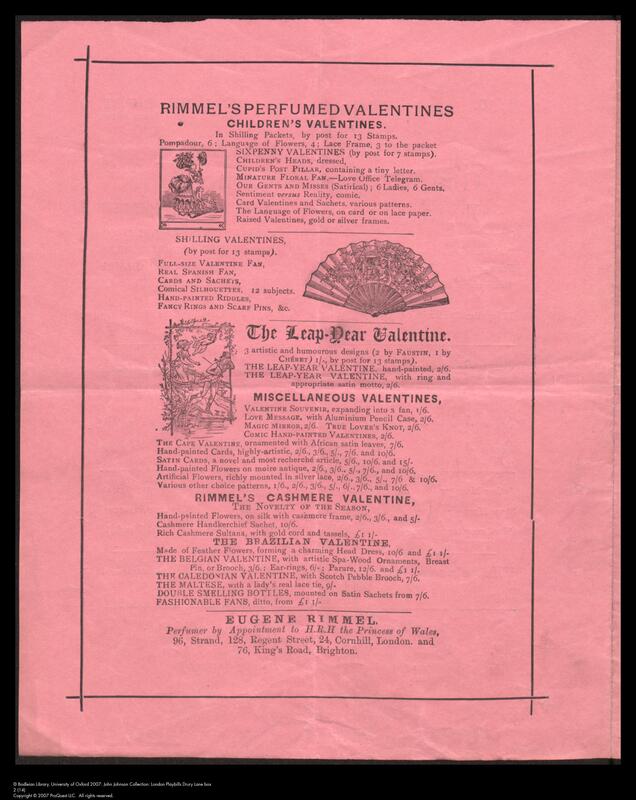 I will explore here valentine-related advertising and, more widely, Rimmel’s relationship with the Theatre, whose programmes he used extensively to advertise his valentines and other seasonal merchandise. 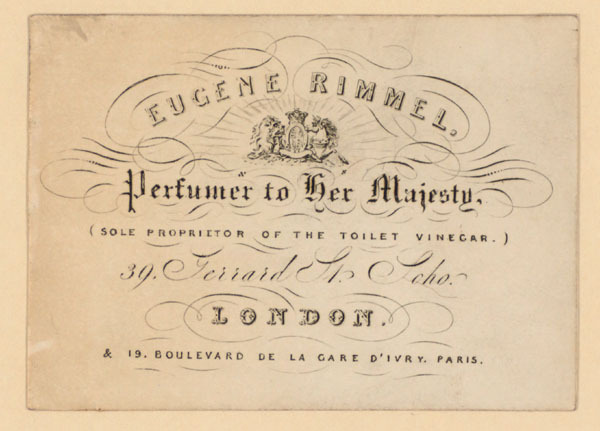 Eugène Rimmel (1820–1887) came to England from France and, with his father, established a perfumery business in London in 1834. From 1847 to 1857, he was in Gerrard St, Soho, with a branch in Paris at 19 boulevard de la Gare d’Ivry (now boulevard Vincent Auriol) in the 13th arrondissement. His claim to fame was as ‘sole proprietor of the toilet vinegar’ (an aromatic vinegar used as an emollient). He already enjoyed the Queen’s patronage. 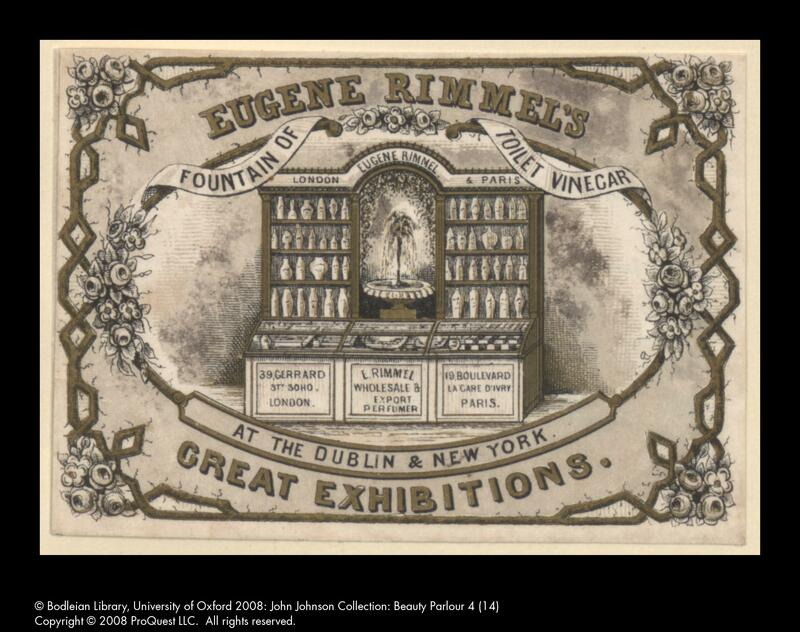 At the Great Exhibition of 1851, Rimmel attracted much attention for his ‘Great Exhibition Bouquet’ and his Perfume Fountain, which was also used in the Exhibition of Art and Art-Industry in Dublin (1853) and the New York Exhibition of the Industry of All Nations (1853–1854). Rimmel used perfume imaginatively, to scent sachet valentines and theatre and concert programmes, including the fine Japanese programmes of the Royal Aquarium (detail below), which were perfumed with E. Rimmel’s Royal Aquarium Bouquet . At the Haymarket in 1889, Rimmel’s Perdita Bouquet, dedicated to the famous actress Mary Anderson, and other perfumes were sold at the bars. The Rimmel publicity machine was impressive. We have programmes in the John Johnson Collection from The Adelphi, Avenue Theatre, Canterbury Theatre of Varieties, Covent Garden, Drury Lane, Queen’s Theatre, Royal Alhambra Palace, Royal Aquarium, Royal Globe and Royalty theatres that proclaim they are perfumed by Rimmel. Undoubtedly, there were others. It is likely that the programmes (for a far wider range of theatres) that carry his advertisements or which are embossed ‘Rimmel’ were also perfumed. Where there is no statement to that effect we cannot be sure, and the perfume itself has of course long since evaporated! and at W.S. Woodin’s Cabinet of Curiosities. 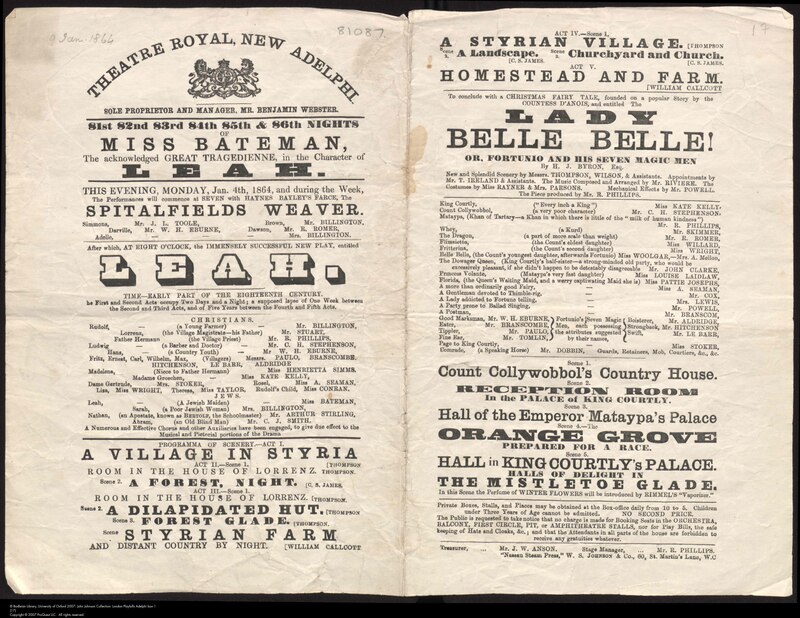 The advantage of theatre programmes and playbills was that they were printed frequently, sometimes daily. They were, therefore, ideal vehicles for seasonal advertising. 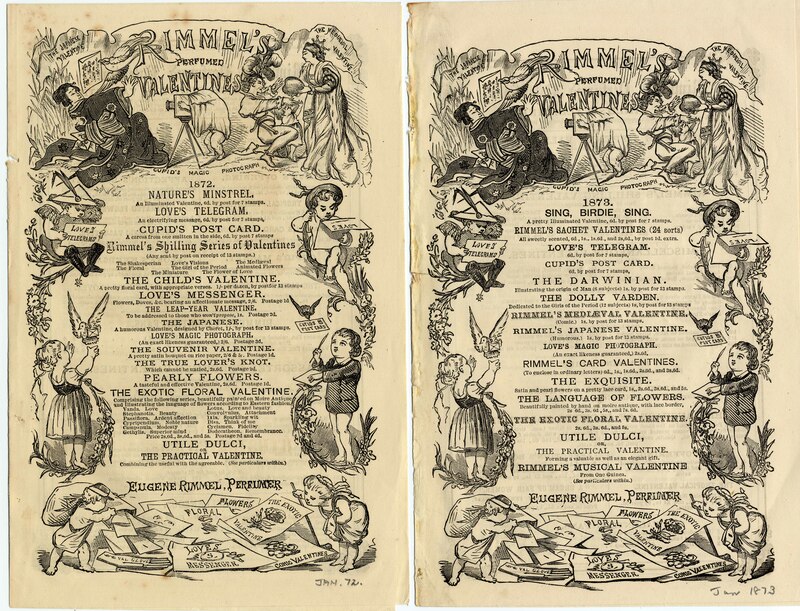 In our holdings are programmes advertising valentines from 1869 to 1873, and for 1875 to 1880, 1885 and 1887. 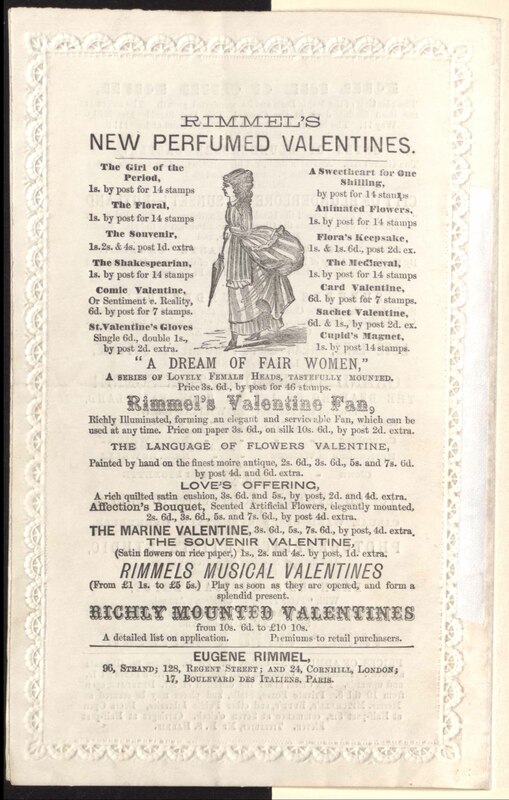 This 1879 advertisement on the back page of a Drury Lane programme for The lost letter and Blue Beard shows that valentines were marketed for children. Rimmel used his countrymen Jules Chéret (more famous for his posters) and Faustin as designers of valentines. Chéret ran a lithographic printing firm in the rue Brunel in Paris and many of Rimmel’s lithographed advertisements and almanacs carry his imprint. Although the annual almanacs were beautifully chromolithographed. the advertising pages (which sometimes refer to valentines) were usually modest. Advertising page from Rimmel’s comic almanac pocket-book, 1886. JJ Beauty Parlour 4 (13) (C) Bodleian Library & ProQuestIt was in his magazine inserts that Rimmel could indulge in more fanciful illustration, often again by Chéret. We have four-page valentine advertisements for 1868, 1869 and 1872-1874, variously printed by Chéret, Stephen Austin (Hertford) and Charles Terry (High Holborn). 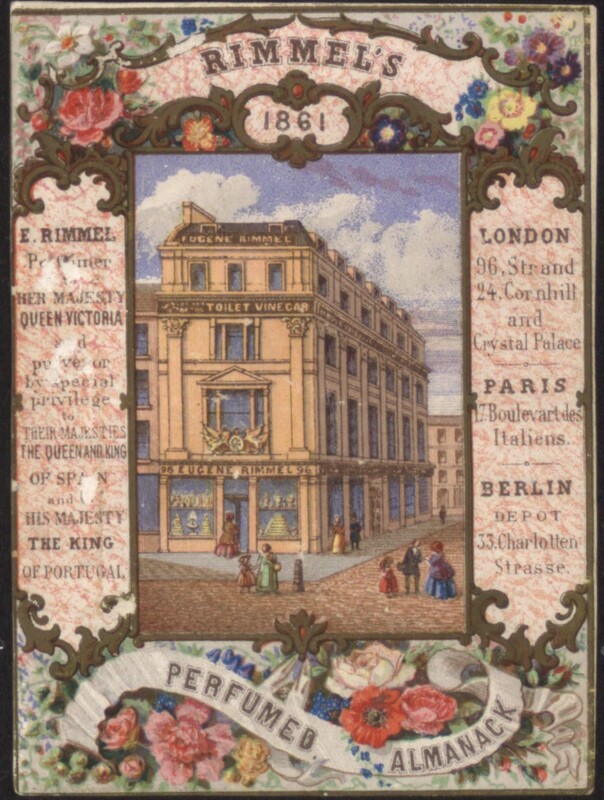 The Rimmel empire continued to expand, with branches in Brighton, Florence, The Hague, Amsterdam, Brussels and Liège by 1874. 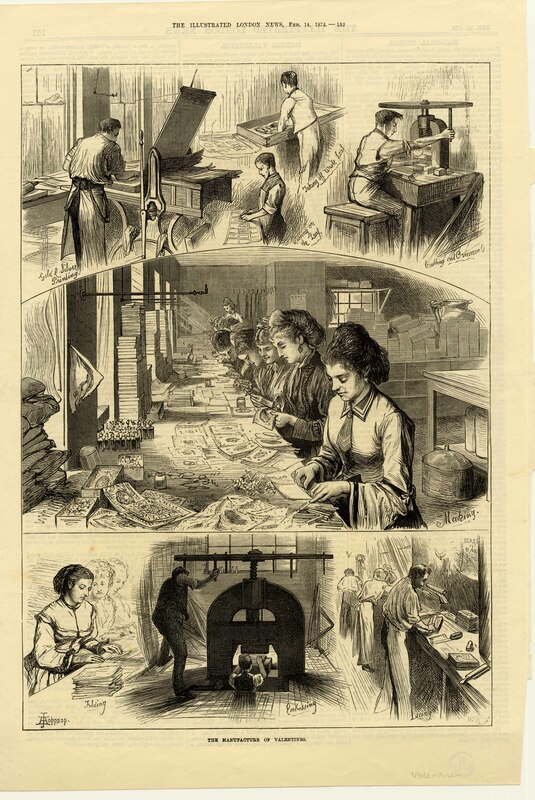 On 14 February 1874, The Illustrated London News showed and described the manufacture of valentines at the printing works of George Meek and the valentine workshop of Eugène Rimmel. Just in time! In March 1875, a fire totally destroyed Beaufort House, the hub of the valentine side of the business. 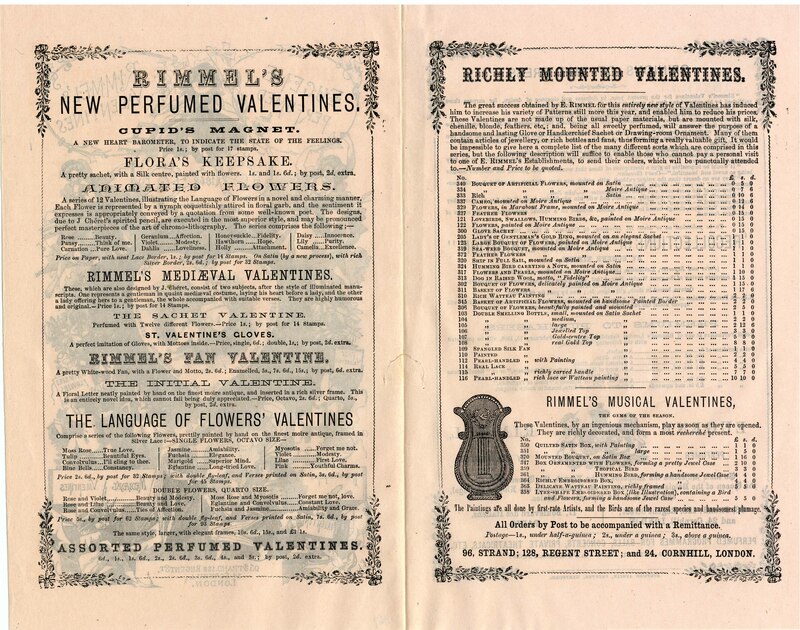 However, valentines continued to be produced, as evidenced by references to Rimmel’s ‘perfumed valentines, all novel and elegant, in great variety. 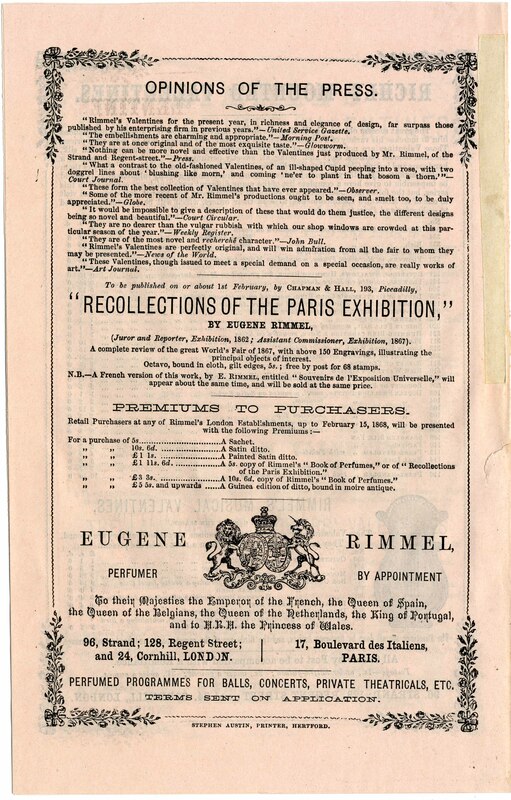 Detailed list on application’ in a Rimmel advert on the back page of a Royal Princess’s Theatre programme for 28 June 1887, for example. However, references to Rimmel valentines are fewer and more modest. The otherwise rich online source for Rimmel research: 19th century UK periodicals (Gale, by subscription) has no results for advertising in magazines beyond 1877. However, as late as 1888, there are small advertisements for Rimmel valentines in newspapers, such as The Standard and The Morning Post which state that a detailed price list is available on application. Perhaps the fashion for valentines was declining, perhaps the firm slightly lost heart after the fire, or perhaps the perfume business was more lucrative. Or perhaps the public had come to associate Rimmel with valentines to such an extent that costly advertising was no longer necessary. 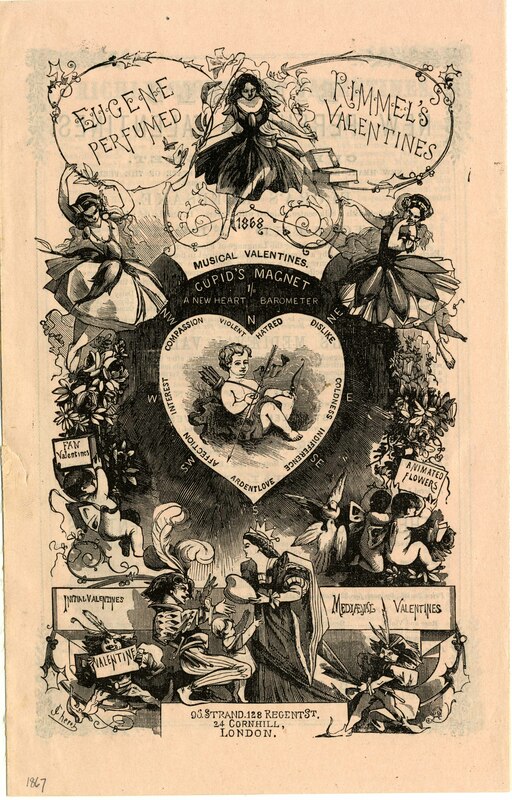 The Standard for 12 February 1887 has a paragraph within its news pages: ‘The approach of St. Valentine’s-day is signalised, as usual, by the production of a number of graceful and ingenious valentines by Rimmel and Co., including expensive ones, and others which are at once tasteful and not too costly ‘. Whatever the case, the lace paper, tinsel, gauze, artificial flowers, feathers, scraps, etc. 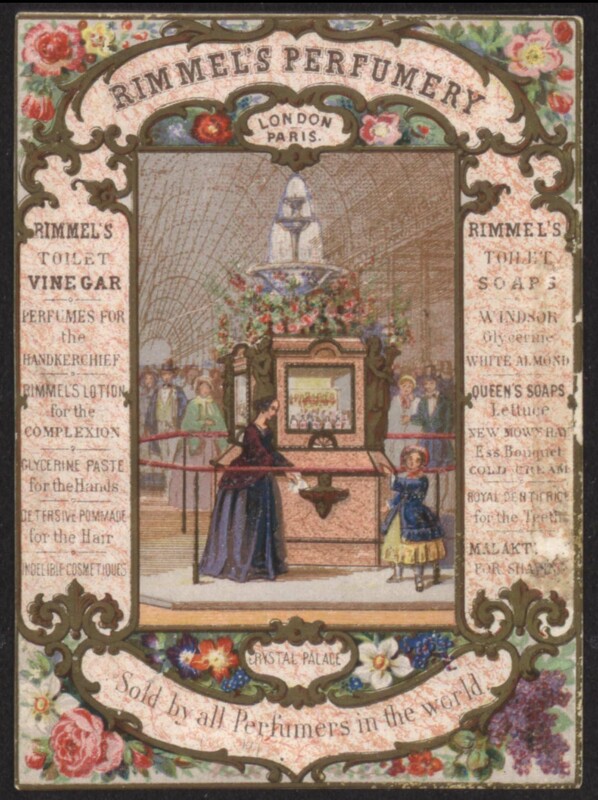 of Rimmel’s elaborate valentines gave pleasure to very many people in the 19th century and continue to do so to those who see them today.